How Do I Use The VAT Tax module? If you are in an area that requires VAT pricing, you are generally required to display your product pricing in a format that includes the item's purchase price as well as the item's charge without tax applied. 3dcart's VAT module allows you to display your product and store prices in the acceptable format for Value Added Tax display. If you have purchased 3dcart's Additional tax module for VAT pricing display, this article will teach you how to set it up. Click on the "Setup Tax" button under "Tax Manager"
This will enable VAT display on your products and checkout pages. This will be the overall tax rate used for the VAT display of your pricing. For example, if your overall tax rate is 10%, you would enter 10 in the box. After you are finished setting up your VAT module, click "Save Changes" at the top to commit the module changes. 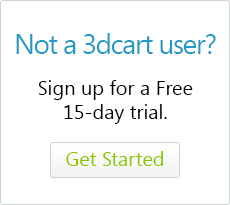 Please be aware that the 3dcart VAT module is only for the display of your pricing in VAT format. The actual tax rates and rules will still need to be created on your store so that appropriate tax rates are charged and applied to your orders. For information on adding tax rules to your store, please click here.